In this blog post, Kevin Hillstrom tells us to ask our business intelligence or data mining or SAS programming expert to profile our e-mail marketing list for us. Keep your analysis simple. Take twelve month buyers, and split them into three groups ... those without an e-mail address, inactive e-mail subscribers, and active e-mail subscribers. Urban, Suburban, and Rural Customers. Customers have different preferences. The rural e-mail subscriber might respond to free shipping promotions. The urban e-mail subscriber might appear to never respond, because she visits stores after receiving an e-mail campaign. Merchandise Preference. E-mail subscribers typically prefer a different merchandise assortment than non e-mail subscribers. You're likely to find that active e-mail subscribers are hyper-loyal to a subset of your merchandise assortment. Brand marketing individuals sometimes wish to use e-mail to communicate a holistic marketing message, whereas the profile might indicate that various e-mail / merchandise combinations represent vital "micro-channels" to customers. Advertising Micro-Channels. Do e-mail subscribers and active e-mail customers purchase using e-mail in combination with catalog marketing, direct marketing, search marketing, or any other kind of marketing? If the answer is yes, your multichannel expert may be right in seeking to align all marketing activities across the company. Future Channels. One of the unintended consequences of multichannel marketing occurs when one form of marketing (e-mail marketing) is effective, causing the customer to switch channels. Most of the Multichannel Forensics projects I work on suggest that customers are much more likely to switch channels than they are to become loyal multichannel shoppers. See if your e-mail marketing activities shift customer behavior. If e-mail marketing causes a shift to a lower-value channel, re-visit the purpose of e-mail marketing. See how a software provider entices 12% of past customers and 31% of all new customers to complete their surveys. Includes a dozen tips to help you craft your survey and subject lines that will gather revenue-boosting responses. Using the open rate to measure email marketing performance is akin to the music industry measuring sales based on the number of CDs sold. It just doesn’t reflect how people buy music today. E-mail software on demand firm Responsys today unveiled a tool the company says will help marketers identify key areas they can work on to improve their e-mail marketing’s relevance. Providing the most popular links to your website within your email campaign can and will increase traffic to your website. The first spam message was sent to 393 users of ARPANET on May 2 1978 by someone from computing pioneers DEC.
StreamSend Blog: What about Hotmail? Over on the Yahoo Mail Blog they stated they have been doing work on Yahoo Mail classic, and of course, anytime they do work, there are bugs. Did you know that many email clients display not only the subject line of a new email arrival, but also the first line of text within the email? Take a look at your current email design. What’s the first line of text? EmailKarma.net: Q&A | Is SPF2.0 Dead? What's the verdict? Is SenderID dead? Do spfv2 records need to be published? Is it sufficient to just publish SPF (v1) records when sending to MSN/Hotmail? Comcast let us know that the Comcast Feedback Loop powered by ReturnPath is now out of beta and has been moved into production. Could your contacts DPI settings be causing your messages to display improperly? The answer is a resounding yes, which is definitely something to think about when conducting your testing. Should the Email Industry Lobby for Stricter CAN-SPAM Legislation? If we all agree that CAN-SPAM legislation is just the bare minimum that email marketers should adhere to in the US, doesn't that mean it's time the email industry lobbies for stricter legislation? In my view stricter US spam legislation (at least require prior consent before you can include someone to your mailinglist) will benefit the industry as a whole. What's your opinion on this? "Yes, legislation for the right reasons, that can actually improve email as communication channel, I agree with. Legislation to punish only the people who can be found and sued is a waste of everybody's time." "I do think that ISP's need to be more accountable for delivery/non-delivery of messages. I would love to see legislation that says if you provide a spam complaint button, you must deliver the complaints to the sender (just like a bounce message). I would like to see legislation against black holing of messages (aka Hotmail). I would also like to see ISP's held responsible for their own networks being abused and pumping out most of the bot-net spam that occurs." "I believe CAN SPAM either needs to evolve or be superceded by stricter anti-spam legislation. However, I'm not holding my breath for that to happen anytime soon, seeing as it took at least eight years for CAN SPAM to be generated and pass." 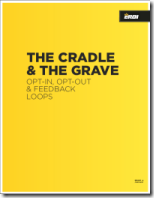 "The biggest disservice Can-Spam did was legitimize the concept of opt-out. If I had a dollar for every forum post or email from marketers assuming Can-Spam compliance was a carte blanche to send what was effectively spam, I'd be writing this from a laptop on a very expensive cruise. Which is why I would love to see the US switch to opt-in. Almost everywhere else has permission as part of their anti-spam legislation, and I don't see email marketing in those countries suffering as a result. After all, permission is a basic best practice." "The problem with legislation is that those who make these rules/laws often do not know the industry as we do and this makes the outcome unpredictable. Not to mention possible other political objectives than just making the world a bit better." It seems that most people are against making legislation stricter, because they fear that only legitimate marketers will be punished. However, I continue to believe that the industry should lobby for an opt-in legislation in the US rather than the current opt-out legislation. The need to have permission before you can legally send marketing emails to consumers is instrumental in creating a positive perception of email marketing and will help safeguard email as an effective marketing channel in the longer term. And yes, I know that having permission is only the first step (of course your emails have to be relevant etc), but it's a very important first step. Read all the answers to my question here (login required) and feel free to share your opinion as well! If you are not a member of the Email Marketer's Club yet, you can request an invitation to join. To determine your optimal frequency, analyze your data and use common sense as your guide. Carefully monitor the results of each send, not just the emails that your subscribers are opening and clicking on, but also the emails they are not reading as this could be a sign of fatigue. It is also important to monitor your open and click-through metrics along with the number of unsubscribes and complaints. While relevant emails have fewer unsubscribes and complaints, the increase in frequency could bump the numbers up somewhat if the emails aren’t directly targeted with new offers and specific information the recipients want. Remember that your subscribers, not your marketing department, are in charge of their own delivery schedule. The way they react and respond to each email lets you know what they like and dislike; so if you capture the right data, you will be able to send each of your subscribers the right information at the right time. Listrak has put together a white paper that explains what you can do to determine your optimal frequency using relevancy tactics, such as metrics and analytics, as well as advanced features like dynamic profiling and dynamic content. Download it here. Announced today the MAAWG Senders Best Practices Document (Version 2.0 - pfd) has been officially released. New guidelines for legitimate email avoid being mistaken for image-based junk mail. List permission and opt-in recommendations have been amended to reflect current best practices. User-unsubscribe processes have been clarified. along with a number of other updates to the document. This is a great document to read as a marketer, and should set the bar for your marketing programs. And in response to @covati's question on Twitter @EmailKarma added: that recommendations changed "enough that you should review it. But maybe not enough to have a drastic impact to your process". Please unsubscribe me from your internet. granny sends a letter asking to be unsubscribed "from your internet" :-) cute! A bill is working its way through the California legislature that supporters contend would strengthen its anti-spam laws and could go in to effect as early as this fall, the San Francisco Chronicle reported last week. Nearly 18% of permission-based e-mail sent in the fourth quarter of 2007 was diverted into recipients’ spam folders, according to the latest deliverability study by e-mail service provider Lyris. May 1st @ 2pm - What is triggered email marketing? When should you use it? Why should you use it? If you’re sending triggered emails in response to one-time events (for example, welcome emails, website confirmation downloads, etc.) then chances are your data is pretty good. Someone does “something” (subscribes, purchases, downloads, etc.) and you trigger an email in response to whatever that something may be. But what about the following, more complicated, scenarios? The “something” event is comprised of multiple data points. The data lives in multiple systems. Send #1 = Renewal date – 90 days. Send #2 = Triggered thank you upon completion OR reminder email 7 days after survey invite sent. You have multiple (sometimes hundreds) subscribers stored per account in your CRM system. Not all contacts should receive the message. The data about what is due to renew / when it is due to renew is stored in a separate area of your CRM system, with no easy way to tie a subscriber to the renewal opportunity. Because you don’t delete data from our CRM system, the subscriber may no longer work at the company. The extensive survey is hosted by a third-part vendor, which means there is no real-time visibility into whether someone has completed the survey within our own system. The list goes on, but suffice it to say that there is a lot of manual data cleaning that goes into pulling a satisfaction survey list and sending the series. So while this seems like an ideal campaign to trigger, it’s just not easy. Understanding what data is needed, where it lives, and what obstacles stand in the way of easily getting that is a huge first step in the right direction. So if you’re looking to automate or optimize your triggered email marketing and have found yourself in a similar situation, understanding your data is a good place to start. eROI surveyed over 500 marketers about their subscribe/unsubscribe process and found that while these processes are improving, they have yet to reach what we would call exceptional. only about 30% of email marketers use a confirmed opt-in method, where a confirmation e-mail including an activation web link (or requiring a reply email) is sent to verify the subscriber. Only 29% of email marketers reiterate the benefits of subscribing on the thank you page, 11% define the email frequency, 11% offer a promotion or coupon, 20% display whitelist instructions and 8% offer additional subscription options. When subscribers opt-in, about 30% of email marketers don’t pass them on to other sytems. When subscribers opt-out, about 65% of email marketers don’t pass them on to another system. After opting out, 90% of email marketers do not follow up with subscribers, leaving a huge opportunity for additional channel communication. Of those that do follow up, 5% use direct mail, 4% follow up via telephone. over three-quarters of marketers do not allow subscribers to adjust frequency settings as an alternative means of unsubscribing. Nearly one-quarter of email marketers don’t know what they currently do with abuse complaints, or how they are handled. Read more here or download the survey results in eROI's resources section (Quarterly Studies tab) . These are very interesting results and they definitely show that there's still a lot of room for improvement. PS. Would you like to have your email marketing program audited and optimized? Let me know! Jeanne Jennings reviews a number of birthday emails she received recently. Very inspiring! We often see emails tied around holidays--especially the ones that mean big bucks for retailers. However, I was delighted to see a few emails in my inbox talking about Earth Day. Two were even completely dedicated to it! Environmental issues are hot right now (and thank goodness - it's about time we start looking after the earth), so it makes great sense to promote your eco-friendly products via email or even your brand's earth-loving attitude. 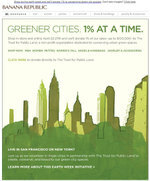 After all, email is the ultimate "green" marketing tool. My favorite of these emails was one by Banana Republic--who promote a cause-related marketing campaign in conjunction with earth day. The chic retailer is promising to donate 1% of its sales--up to $100,000 to Trust for Public Land, a non-profit dedicated to protecting green space. At the bottom it even calls for volunteers in New York and San Francisco to come out and help the cause in person. While it's still all about the bottom line, this campaign just seems a lot more caring than the 'buy our eco-friendly products' by some of the other emails. A great way to do something good for the world, and an awesome use of email. Another interesting challenge posed to us by Kevin Hillstrom. Do you know the answer to his questions? How does personal e-mail use and influence vary between online US Hispanics and non-Hispanics? To what extent have US Hispanic e-mail users adopted social messaging instead of e-mail for personal communication? But consumer standards of relevance are high. Q: Do I need to be concerned about my sender reputation when sending triggered email messages? think about what message you want readers to take away from their 51 seconds with your e-newsletter. Consumers feel in control: Most consumers (88%) feel mostly or completely in control of their inboxes – up nine points from 2004. General attitudes toward corporate e-mail are positive: More people (58%) believe e-mail is a great way for companies to stay in touch – up from 45% three years ago. E-mail is effective: Half of the respondents made an online purchase in the previous year as a result of permission-based marketing – up 3 percentage points from one year ago. E-mail can influence decisioning: Half of respondents reported that a company that does a good job with e-mail influenced their decision to do business – up 6% points from last year. However, e-mail can also close doors:About one-third (32%) have stoppeddoing business with at least one company as a result of poor e-mail marketing practices. Relevancy is in the eye of the beholder: Consumers (41%) consider transaction confirmation emails to be most relevant, followed by account summary emails (18%). It's important to let subscribers know exactly what they can expect from you even before they opt in to your program. Then, meet or exceed those expectations throughout the relationship. This creates engaged subscribers who will anticipate your messages and act on them. "If you ever happen to meet me in real life, I'm a twenty-something male, 6'2" tall, 180 pounds of pure muscle, with a full head of curly dark hair. Alas, if we ever do meet or you see my photo, you'll find out the only part of that description that is accurate is the fact that I'm male. I would fail to live up to your expectations." So it is with email. If you don't live up to subscribers' expectations, they might end up making false assumptions based on their experiences with other Web sites, email campaigns and newsletters. Which are those crucial touch points? What are the basic principles that apply throughout the subscriber relationship? And what are typical things your subscribers expect from you and where they have likely been disappointed before? Read the full article to find out. Event-based email - so many messages, so many modules! event-based email marketing - what is the best way to manage them? Does it make sense to leverage enterprise marketing management systems (EMM) or technology from an on-premise or hosted email service provider? They simply use their brand name. They use their dot-com branding. They use their brand name plus the name of the newsletter. They use their brand name plus the name of their division. Branding in the sender address is critical become not all email clients display sender names; some just display sender addresses. When looking at the branding of sender addresses of promotional emails, it comes down to whether the retailer uses branding after the @-sign in their address, or both before and after it. The consensus is the more branding the better, with 73% of major online retailers including their brand name both before and after the @-sign. The remaining 27% use branding only after the @-sign; none use branding only before it. Clearly, a lack of branding before the @-sign is not a reason to change your sender address, but it’s something to consider the next time a change of sender address is required. Please join me in welcoming Kelly Rusk as our newest co-blogger on BeRelevant! Kelly Rusk offers a fresh, yet insightful look into the email marketing world. She began her email career as communications manager for cardcommunications, an email marketing professional services firm based out of Ottawa, Canada, where she managed the company newsletter and blog while helping clients devise smart email strategies and analyze reporting metrics. In 2006, she led an initiative to be the first Canadian company publishing email trends report, which she oversaw until the company was acquired. She was also a contributor to Chris Baggott's book "Email Marketing by the Numbers." While at Sitebrand (which acquired cardcommunications) her focus shifted to email marketing clients in the online retail sector. Now Kelly has a broadened professional focus as a communications officer in the public sector, however she still keeps her mouse on the pulse of email marketing through the BeRelevant blog and other industry resources. She also blogs about using social media for PR and marketing at web2dotwhat.com. Are you interested in becoming a regular blogger on BeRelevant as well? Let me know! For my debut on BeRelevant, I'm going to share five lessons about email you should master, because they will help you in other marketing scenarios as well. Although I've spent most of my career working in email marketing, my current position is a broader communications role (email still plays a part) I also spend a lot of time on the social media bandwagon--current obsession is Twitter, of course! However, no matter what I'm doing, I'm finding what I've learned about email works in almost any marketing/communications situation. Be concise - Email marketing requires you to capture your recipient's attention in an instance. Since we all live by our inboxes, on average the population's attention span has deteriorated greatly over the past few years. I think long copy has its place--in a book, magazine or even a user manual. However, short snappy copy wins for virtually any marketing application. Put the customer first - Sure we always say "the customer is always right," but we don't always practice what we preach. With email, failing to give subscribers exactly what they want can have serious consequences (Hello "Report as Spam" button! ), so smart email marketers strive to provide targeted, relevant and interesting content that subscribers want to receive. Sure, other media have constraints, but if always approach marketing with a truly customer-centric mindset, we'd see a lot less ineffective marketing out there. Test, measure, refine - The granular nature of email metrics paired with the ease of testing makes email the ultimate tool to measure and constantly improve. With a little analysis, you can easily pinpoint where a campaign went wrong, or what is causing a drop in subscribers, opens, etc. Once you've mastered the process of constantly testing, measuring and refining, it's easily applied to any sort of marketing campaign. Always add value - If someone takes the time to open your email, you'd better offer something of value if you want to keep a happy, active subscriber. Adding value helps build loyalty and lifelong customers. It's long-term value vs. short-term gains, and it's not just for email. Planning makes perfect - Ok, so it may be a no-brainer that planning is a pretty good idea. We do marketing plans, communications plans, strategic plans, etc. However, to upper management, email is just something we do to satisfy corporate goals. While email should satisfy goals--there's more to it. Building an email strategy, instead of treating it as a tactic, is a sure shot at success, and this can be applied to any other marketing 'tactic'. Still think mobile has no relevance to your e-mail marketing program? Think again. With more than 250 million wireless users in the USA and more than 3 billion users worldwide, mobile phones have reached mainstream status. The sign-up form is your flirtatious comment, the kind gesture, the body language that encourages someone to enter into a relationship with you (by submitting their email address). So it better be good. In this Special Report, MarketingSherpa looks at how to market in Central and Eastern Europe and give examples of email campaigns that are working there. The new service allows e-mail marketers to monitor the mailing behavior of firms with which they share data The service can be used with existing seeding accounts, Gmail, AOL, Yahoo MSN Hotmail accounts, and custom domains provided by LashBack. If there is one message American marketers should take away from last week’s court ruling against e-mail marketer e360 Insight, it’s this: Rightly or wrongly, simply being Can Spam compliant is not enough to get e-mail delivered. Email Authentication - Are you in the game? David Baker uses Maslow's hierarchy to talk about email programs and where they fit in helping consumers fulfill needs. Melinda Krueger answers the question "Do you have any hard facts (statistics!) or success stories that prove the way to the readers’ hearts is through content that they actually care about, and not what we want to tell them?"